Nebraska’s area is just over 77,220 square miles (200,000 km2) with a population of almost 1.9 million people. Its state capital is Lincoln, and its largest city is Omaha, which is on the Missouri River. Indigenous peoples, including Omaha, Missouria, Ponca, Pawnee, Otoe, and various branches of the Lakota (Sioux) tribes, lived in the region for thousands of years before European exploration. The state is crossed by many historic trails, including that of the Lewis and Clark Expedition. Nebraska is composed of two major land regions: the Dissected Till Plains and the Great Plains. The Dissected Till Plains region consist of gently rolling hills and contains the state’s largest cities, Omaha and Lincoln. The Great Plains region, occupying most of western Nebraska, is characterized by treeless prairie, suitable for cattle-grazing. Nebraska has two major climatic zones. The eastern half of the state has a humid continental climate (Köppen climate classification Dfa); a unique warmer subtype considered “warm-temperate” exists near the southern plains like in Kansas and Oklahoma which have a predominantly humid subtropical climate. The western half of the state has a primarily semi-arid climate (Koppen BSk). The state has wide variations between winter and summer temperatures, variations that decrease moving south in the state. Violent thunderstorms and tornadoes occur primarily during spring and summer and sometimes in autumn. Chinook winds tend to warm the state significantly in the winter and early spring. Nebraska’s name is derived from transliteration of the archaic Otoe words Ñí Brásge, pronounced [ɲĩbɾasꜜkɛ] (contemporary Otoe Ñí Bráhge), or the Omaha Ní Btháska, pronounced [nĩbɫᶞasꜜka], meaning “flat water”, after the Platte River that flows through the state. 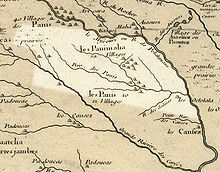 Nebraska in 1718, Guillaume de L’Isle map, with the approximate area of the future state highlighted. Indigenous peoples lived in the region of present-day Nebraska for thousands of years before European exploration. The historic tribes in the state included the Omaha, Missouria, Ponca, Pawnee, Otoe, and various branches of the Lakota (Sioux), some of which migrated from eastern areas into this region. When European exploration, trade, and settlement began, both Spain and France sought to control the region. In the 1690s, Spain established trade connections with the Apaches, whose territory then included western Nebraska. By 1703, France had developed a regular trade with the native peoples along the Missouri River in Nebraska, and by 1719 had signed treaties with several of these peoples. After war broke out between the two countries, Spain dispatched an armed expedition to Nebraska under Lieutenant General Pedro de Villasur in 1720. The party was attacked and destroyed near present-day Columbus by a large force of Pawnees and Otoes, both allied to the French. The massacre ended Spanish exploration of the area for the remainder of the 18th century. In 1762, during the Seven Years’ War, France ceded the Louisiana territory to Spain. This left Britain and Spain competing for dominance along the Mississippi; by 1773, the British were trading with the native peoples of Nebraska. In response, Spain dispatched two trading expeditions up the Missouri in 1794 and 1795; the second, under James Mackay, established the first European settlement in Nebraska near the mouth of the Platte. Later that year, Mackay’s party built a trading post, dubbed Fort Carlos IV (Fort Charles), near present-day Homer. In 1819, the United States established Fort Atkinson as the first U.S. Army post west of the Missouri River, just east of present-day Fort Calhoun. The army abandoned the fort in 1827 as migration moved further west. European-American settlement was scarce until 1848 and the California Gold Rush. On May 30, 1854, the US Congress created the Kansas and the Nebraska territories, divided by the Parallel 40° North, under the Kansas–Nebraska Act. The Nebraska Territory included parts of the current states of Colorado, North Dakota, South Dakota, Wyoming, and Montana. The territorial capital of Nebraska was Omaha. In the 1860s, after the U.S. government forced many of the Native American tribes to cede their lands and settle on reservations, it opened large tracts of land to agricultural development by Europeans and Americans. 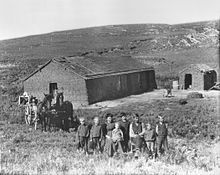 Under the Homestead Act, thousands of settlers migrated into Nebraska to claim free land granted by the federal government. Because so few trees grew on the prairies, many of the first farming settlers built their homes of sod, as had Native Americans such as the Omaha. The first wave of settlement gave the territory a sufficient population to apply for statehood. Nebraska became the 37th state on March 1, 1867, and the capital was moved from Omaha to the center at Lancaster, later renamed Lincoln after the recently assassinated President of the United States, Abraham Lincoln. The battle of Massacre Canyon on August 5, 1873, was the last major battle between the Pawnee and the Sioux. During the 1870s to the 1880s, Nebraska experienced a large growth in population. Several factors contributed to attracting new residents. The first was that the vast prairie land was perfect for cattle grazing. This helped settlers to learn the unfamiliar geography of the area. The second factor was the invention of several farming technologies. Agricultural inventions such as barbed wire, wind mills, and the steel plow, combined with good weather, enabled settlers to use of Nebraska as prime farming land. By the 1880s, Nebraska’s population had soared to more than 450,000 people. The Arbor Day holiday was founded in Nebraska City by territorial governor J. Sterling Morton. The National Arbor Day Foundation is still headquartered in Nebraska City, with some offices in Lincoln. The state is bordered by South Dakota to the north; Iowa to the east and Missouri to the southeast, across the Missouri River; Kansas to the south; Colorado to the southwest; and Wyoming to the west. The state has 93 counties and is split between two time zones, with the state’s eastern half observing Central Time and the western half observing Mountain Time. Three rivers cross the state from west to east. The Platte River, formed by the confluence of the North Platte and the South Platte, runs through the state’s central portion, the Niobrara River flows through the northern part, and the Republican River runs across the southern part. Nebraska is composed of two major land regions: the Dissected Till Plains and the Great Plains. The easternmost portion of the state was scoured by Ice Age glaciers; the Dissected Till Plains were left after the glaciers retreated. The Dissected Till Plains is a region of gently rolling hills; Omaha and Lincoln are in this region. 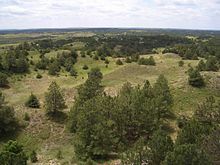 The Great Plains occupy most of western Nebraska, with the region consisting of several smaller, diverse land regions, including the Sandhills, the Pine Ridge, the Rainwater Basin, the High Plains and the Wildcat Hills. Panorama Point, at 5,424 feet (1,653 m), is Nebraska’s highest point; though despite its name and elevation, it is a relatively low rise near the Colorado and Wyoming borders. A past Nebraska tourism slogan was “Where the West Begins” (currently, “Honestly, it’s not for everyone”); locations given for the beginning of the “West” include the Missouri River, the intersection of 13th and O Streets in Lincoln (where it is marked by a red brick star), the 100th meridian, and Chimney Rock. Two major climatic zones are represented in Nebraska: the state’s eastern half and its western half. The eastern half of the state has a humid continental climate (Köppen climate classification Dfa). The western half has a semi-arid climate (Koppen BSk). The entire state experiences wide seasonal variations in both temperature and precipitation. Average temperatures are fairly uniform across Nebraska, with hot summers and generally cold winters. Average annual precipitation decreases east to west from about 31.5 inches (800 mm) in the southeast corner of the state to about 13.8 inches (350 mm) in the Panhandle. Humidity also decreases significantly from east to west. Snowfall across the state is fairly even, with most of Nebraska receiving between 25 to 35 inches (640 to 890 mm) of snow each year. Nebraska’s highest-recorded temperature was 118 °F (48 °C) in Minden on July 24, 1936. The state’s lowest-recorded temperature was −47 °F (−44 °C) in Camp Clarke on February 12, 1899. Nebraska is located in Tornado Alley. Thunderstorms are common during both the spring and the summer. Violent thunderstorms and tornadoes happen primarily during those two seasons, although they also can occur occasionally during the autumn. The chinook winds from the Rocky Mountains provide a temporary moderating effect on temperatures in the state’s western portion during the winter. The United States Census Bureau estimates that the population of Nebraska was 1,929,268 on July 1, 2018, a 5.64% increase since the 2010 United States Census. The center of population of Nebraska is in Polk County, in the city of Shelby. The table below shows the racial composition of Nebraska’s population as of 2016. According to the 2016 American Community Survey, 10.2% of Nebraska’s population were of Hispanic or Latino origin (of any race): Mexican (7.8%), Puerto Rican (0.2%), Cuban (0.2%), and other Hispanic or Latino origin (2.0%). The five largest ancestry groups were: German (36.1%), Irish (13.1%), English (7.8%), Czech (4.7%), and American (4.0%). As of 2011, 31.0% of Nebraska’s population younger than age 1 were minorities. Fifty-three of Nebraska’s 93 counties reported declining populations between 1990 and 2000, ranging from a 0.06% loss (Frontier County) to a 17.04% loss (Hitchcock County). More urbanized areas of the state have experienced substantial growth. In 2000, the city of Omaha had a population of 390,007; in 2005, the city’s estimated population was 414,521 (427,872 including the recently annexed city of Elkhorn), a 6.3% increase over five years. The 2010 census showed that Omaha has a population of 408,958. The city of Lincoln had a 2000 population of 225,581 and a 2010 population of 258,379, a 14.5% increase. Nebraska has a state sales and use tax of 5.5%. In addition to the state tax, some Nebraska cities assess a city sales and use tax, in 0.5% increments, up to a maximum of 1.5%. Dakota County levies an additional 0.5% county sales tax. Food and ingredients that are generally for home preparation and consumption are not taxable. All real property within the state of Nebraska is taxable unless specifically exempted by statute. Since 1992, only depreciable personal property is subject to tax and all other personal property is exempt from tax. Inheritance tax is collected at the county level. The Bureau of Economic Analysis estimates of Nebraska’s gross state product in 2010 was $89.8 billion. Per capita personal income in 2004 was $31,339, 25th in the nation. Nebraska has a large agriculture sector, and is a major producer of beef, pork, corn (maize), soybeans, and sorghum. Other important economic sectors include freight transport (by rail and truck), manufacturing, telecommunications, information technology, and insurance. the 5th lowest in the nation. Kool-Aid was created in 1927 by Edwin Perkins in the city of Hastings, which celebrates the event the second weekend of every August with Kool-Aid Days, and Kool-Aid is the official soft drink of Nebraska. CliffsNotes were developed by Clifton Hillegass of Rising City. He adapted his pamphlets from the Canadian publications, Coles Notes. Omaha is home to Berkshire Hathaway, whose chief executive officer (CEO), Warren Buffett, was ranked in March 2009 by Forbes magazine as the second-richest person in the world. The city is also home to Mutual of Omaha, InfoUSA, TD Ameritrade, West Corporation, Valmont Industries, Woodmen of the World, Kiewit Corporation, Union Pacific Railroad, and Gallup. Ameritas Life Insurance Corp., Nelnet, Sandhills Publishing Company, Duncan Aviation, and Hudl are based in Lincoln; The Buckle is based in Kearney. Sidney is the national headquarters for Cabela’s, a specialty retailer of outdoor goods. The world’s largest train yard, Union Pacific‘s Bailey Yard, is in North Platte. The Vise-Grip was invented by William Petersen in 1924, and was manufactured in De Witt until the plant was closed and moved to China in late 2008. Lincoln’s Kawasaki Motors Manufacturing is the only Kawasaki plant in the world to produce the Jet Ski, All-terrain vehicle (ATV), and Mule lines of product. The facility employs more than 1,200 people. The Spade Ranch, in the Sandhills, is one of Nebraska’s oldest and largest beef cattle operations. 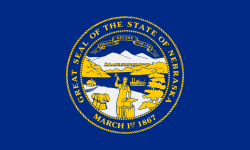 Nebraska’s government operates under the framework of the Nebraska Constitution, adopted in 1875, and is divided into three branches: executive, legislative, and judicial. Nebraska is the only state in the United States with a unicameral legislature. Although this house is officially known simply as the “Legislature“, and more commonly called the “Unicameral”, its members call themselves “senators”. Nebraska’s Legislature is also the only state legislature in the United States that is officially nonpartisan. The senators are elected with no party affiliation next to their names on the ballot, and members of any party can be elected to the positions of speaker and committee chairs. The Nebraska Legislature can also override the governor’s veto with a three-fifths majority, in contrast to the two-thirds majority required in some other states. Unicameral supporters also argued that a bicameral legislature had a significant undemocratic feature in the committees that reconciled House and Senate legislation. Votes in these committees were secretive, and would sometimes add provisions to bills that neither house had approved. Nebraska’s unicameral legislature today has rules that bills can contain only one subject, and must be given at least five days of consideration. In 1934, due in part to the budgetary pressure of the Great Depression, Nebraska citizens ran a state initiative to vote on a constitutional amendment creating a unicameral legislature, which was approved, which, in effect, abolished the House of Representatives (the lower house). 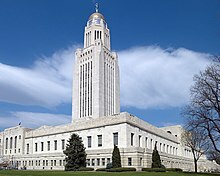 The Legislature meets in the third Nebraska State Capitol building, built between 1922 and 1932. It was designed by Bertram G. Goodhue. Built from Indiana limestone, the capitol’s base is a cross within a square. A 400-foot domed tower rises from this base. The Sower, a 19-foot bronze statue representing agriculture, crowns the building. The judicial system in Nebraska is unified, with the Nebraska Supreme Court having administrative authority over all the courts within the state. Nebraska uses the Missouri Plan for the selection of judges at all levels, including county courts (as the lowest-level courts) and twelve district courts, which contain one or more counties. The Nebraska State Court of Appeals hears appeals from the district courts, juvenile courts, and workers’ compensation courts, and is the final court of appeal. Nebraska’s U.S. senators are Deb Fischer and Ben Sasse, both Republicans; Fischer, elected in 2012, is the senior. Nebraska is one of two states (Maine being the other) that allow for a split in the state’s allocation of electoral votes in presidential elections. Under a 1991 law, two of Nebraska’s five votes are awarded to the winner of the statewide popular vote, while the other three go to the highest vote-getter in each of the state’s three congressional districts. For most of its history, Nebraska has been a solidly Republican state. Republicans have carried the state in all but one presidential election since 1940: the 1964 landslide election of Lyndon B. Johnson. In the 2004 presidential election, George W. Bush won the state’s five electoral votes by a margin of 33 percentage points (making Nebraska’s the fourth-strongest Republican vote among states) with 65.9% of the overall vote; only Thurston County, which is majority-Native American, voted for his Democratic challenger John Kerry. In 2008, the state split its electoral votes for the first time: Republican John McCain won the popular vote in Nebraska as a whole and two of its three congressional districts; the second district, which includes the city of Omaha, went for Democrat Barack Obama. ^ LTC. “Nebraska Legislature”. nebraskalegislature.gov. Retrieved February 20, 2019. ^ LTC. “Nebraska Legislature”. nebraskalegislature.gov. Retrieved September 4, 2017. ^ Koontz, John. “Etymology”. Siouan Languages. Retrieved November 28, 2006. ^ a b Hanson, James A. “Spain on the Plains”. Nebraska History 74 (Spring 1993), pp. 2–21. Retrieved January 4, 2015. ^ “Villasur Sent to Nebraska”. Archived May 25, 2017, at the Wayback Machine Nebraskastudies.org. Retrieved January 4, 2015. ^ “The Villasur expedition—1720”. Nebraska State Historical Society. Retrieved January 4, 2015. ^ “Louisiana: European explorations and the Louisiana Purchase”. Library of Congress. Retrieved January 4, 2015. ^ Wood, W. Raymond. “Fort Charles or Mr. Mackey’s Trading House”. Nebraska History 76 (Spring 1995), pp. 2–9. Retrieved January 4, 2015. ^ Interactive Media Group – Nebraska Educational Telecommunications. “1854 Kansas-Nebraska Act signed”. Nebraskastudies.unl.edu. Retrieved May 22, 2012. ^ Marsha Hoffman and Dwight A. Radford, “Nebraska,” Redbook: American State, County, and Town Sources, 3rd ed. (Provo: Ancestry, 2004), 408. ^ Rodrigo, Chris Mills (October 18, 2018). “Nebraska releases new slogan: ‘Honestly, it’s not for everyone‘“. TheHill. ^ “Nebraska Climate Office | Applied Climate Science | SNR | UNL”. Nebraskaclimateoffice.unl.edu. July 23, 2009. Archived from the original on December 7, 2008. Retrieved April 17, 2010. ^ “Climate – Twin Cities Development Association, Inc. – Nebraska: Scottsbluff, Gering, TerryTown, Mitchell, Bayard”. Tcdne.org. Archived from the original on June 4, 2009. Retrieved February 24, 2009. ^ “Nebraska climate averages”. Weatherbase. Retrieved November 9, 2015. ^ Resident Population Data (May 22, 2012). “Resident Population Data – 2010 Census”. 2010.census.gov. Archived from the original on October 19, 2013. Retrieved May 22, 2012. ^ a b “QuickFacts Nebraska; UNITED STATES”. 2018 Population Estimates. United States Census Bureau, Population Division. March 5, 2019. Retrieved March 5, 2019. ^ “2010 Census Data”. Census.gov. Retrieved September 4, 2017. ^ “Religious Landscape Study”. Pewforum.com. May 11, 2015. Retrieved December 12, 2017. ^ a b “City and Town Population Totals: 2010-2017”. United States Census Bureau. Retrieved July 6, 2018. ^ “State Individual Income Tax Rates, 2000–2010”. The Tax Foundation. March 25, 2010. Retrieved March 3, 2011. 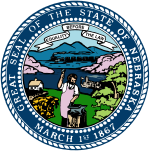 ^ “Frequently Asked Questions about Nebraska Sales and Use Tax”. Nebraska Department of Revenue. Retrieved August 27, 2012. ^ “Sales and Use Tax FAQs”. Revenue.ne.gov. Retrieved September 4, 2017. ^ “Nebraska State Agriculture Overview – 2006” (PDF). United States Department of Agriculture. Archived from the original (PDF) on October 25, 2007. Retrieved October 17, 2007. ^ “History: Kool-Aid: Hastings Museum”. Hastings Museum. Archived from the original on February 5, 2009. Retrieved February 24, 2009. ^ Jirovsky, Kristin. “Owner of Nail Jack Tools wants to share former Vise-Grip plant”, Lincoln Journal-Star. January 8, 2009. ^ “Profile Showing the Grades upon the Different Routes Surveyed for the Union Pacific Rail Road Between the Missouri River and the Valley of the Platte River”. World Digital Library. 1865. Retrieved July 16, 2013. ^ “Nebraska as a State”. Andreas’s History of the State of Nebraska.. Retrieved February 18, 2010. Hickey, Donald R. Nebraska Moments: Glimpses of Nebraska’s Past (1992).